Somewhere, out there in the world, Louis Walsh is currently being revived with some smelling salts after swooning with sheer delight. Irish boyband Westlife have finally reunited, after years of longing from adoring fans. The lads – Kian, Nicky, Mark and Shane – have recorded a spanking new album and are planning to tour in 2019. Six years after splitting up – and two decades since their original formation – Westlife have signed a new deal with Universal and they’re looking as dapper as ever in their announcement video. Westlife. New music. New tour. Coming soon. We genuinely missed each other and missed the buzz of performing on stage together to all our fans. We still have a lot that we want to achieve as a band and we want to bring our new music to fans all over the world. It felt so great to be back in the studio together and hanging out with each other again. It just felt right. We’re fresh, ready and so excited for this new next chapter of Westlife. Brian McFadden, who left Westlife back in 2004, will not be joining his former bandmates; instead focusing his attentions on competing on 2019’s Dancing On Ice. Formed in Dublin back in 1998, the boys went their separate ways as of 2012, having enjoyed enormous success as a group. Many noughties teenagers will of course recall blu-tacking a Westlife poster pride of place on their bedroom wall. C’mon admit it! With 10 multi platinum albums under their belt in the UK alone, they’ve scooped two Brit Awards, an MTV Award and a World Music Award. Despite their six year absence from the music scene, Westlife still have a wide and enthusiastic fanbase; with their romantic ballads gracing many a wedding reception. Following the announcement, fans have come out in droves, lighters at the ready for what is set to be a packed – and emotional – stadium tour. 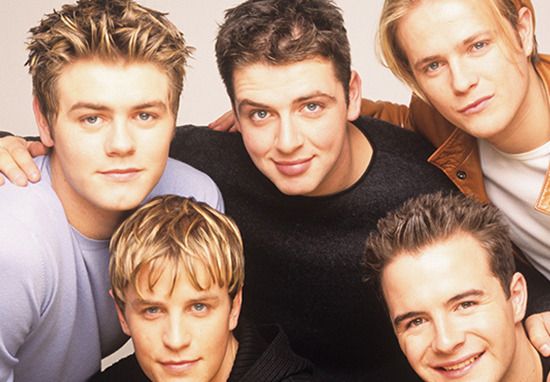 Westlife may be giving out retro ’90s vibes, but they sure know how to break the internet Kardashian style. I literally teared up! Ridiculous! But I love them so much! Others spoke of ‘shaking with excitement’ and being ‘unable to breathe’. Westlife have millions of fans all over the world so it was really a no-brainer for the boys that they would get back together one day. They’ve kept quiet on the speculation for the last few days but decided now was the right time to let their fans know they’re coming back. Welcome back Westlife. It’s good to come Face to Face with you all once again!